« Record audience flock to see Guy Henry Q & A. It is eerily appropriate that this powerful political drama is being staged on the 500th anniversary of Machiavelli’s masterpiece The Prince. As a disquisition on the nature of power and the ruthless politics of Tudor government it certainly resonates. The great achievement of Hilary Mantel’s and Mike Poulton’s collaboration is to capture the humanity and complexity of the characters. Nathaniel Parker gives us much more than the lecherous monster of popular imagination. Here is a man of great affability and charm tortured by the imperative of producing a male heir to save his kingdom from renewed civil war and anarchy. This depth of characterisation can be seen in Lydia Leonard’s superb portrayal of Anne Boleyn. Believing her position secure she is initially angered rather than frightened by the pallid, and to her, inexplicable charms of Jane Seymour. The Queen has built a power base of reforming bishops who will protect her. Her realisation that this has crumbled to nothing because she cannot produce a son is breathtakingly painful to watch. 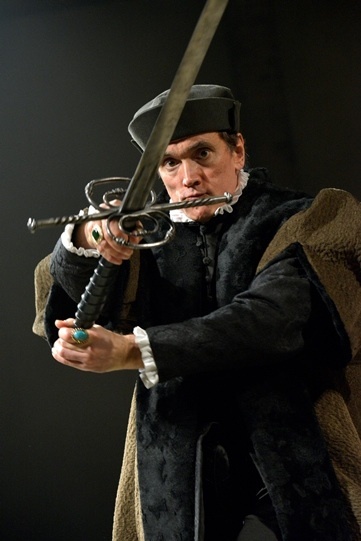 Ben Miles’s Cromwell provokes an increasingly ambivalent attitude from the audience. We are pleased to see the underdog outwit his arrogant persecutors. Once Cromwell has achieved the downfall of the Queen and her alleged lovers we feel an uncomfortable realisation that Master Secretary is not merely doing the king’s will but has carried out a terrible act of revenge in his own interest. A fantastic piece of theatre, get tickets if you can! Revenge, a dish best served cold.